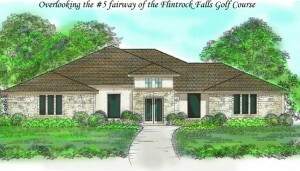 The four-bedroom home is one of just 20 residences to be built in the most exclusive section of this Nicklaus golf course community in the hills west of Austin. With 3,905 square feet, the home features an open entry that flows directly into a large living space and gourmet kitchen. A large Fleetwood sliding glass door gives a peek onto the covered terrace, which includes a summer kitchen complete with a stainless steel gas grill. Two secondary bedrooms and a spacious game room form one side of the home. The other side contains an oversized Master Suite and a separate casita, which can serve as a private suite for overnight guests or long-term visitors. The casita is accessed by a separate one-car garage and connects to the rest of the home through a outdoor covered loggia. Other elements in this luxurious home, now under construction, include a formal dining room, butler’s pantry, study and computer alcove. Escavara is the newest section in Flintrock Falls, a gated community with 72 holes of golf including two Jack Nicklaus designed courses. Escavara contains some of the community’s largest home sites, ranging from 1/3 to 3/4 acres. Every home in Escavara backs to the golf course and offers striking golf course and Hills Country views. The Hills Country Club’s offerings extend beyond golf to include a state of the art tennis complex, full workout facility, two clubs for entertaining and a resort-style swimming pool. Plus, the community offers homeowners easy access to year-round recreation on the largest and cleanest lake in Central Texas, Lake Travis. Sterling Custom Homes or call Jerry Winnett at 877-263-3500.